Village of the DamnedAt a quiet little village in England, something odd has happened — everyone in the village has fallen asleep. Everyone who enters, or flies over, also falls asleep. And afterward, every woman in the village of child-bearing age finds herself pregnant. All of the children born are blond, with strange eyes, who mature extremely rapidly. And they seem … unworldly. 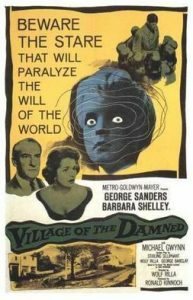 The Village of the Damned is a great many things – science fiction, cold war paranoia, a story of longing for family. But at its heart, it’s about people – like all great stories. 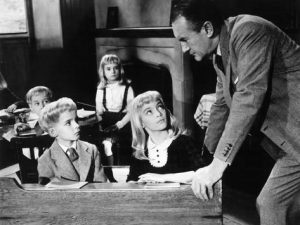 And every time I watch it, my heart breaks for George Sanders. George Sanders often played the heavy in films, but here he plays an older married man who yearns to have a son. And, impossibly, he and his wife Barbara Shelley expect a child. As part of the bizarre situation at the village. Even though he comes to realize that his child isn’t truly his son, he stills cares for him and seeks to protect him. Until he realizes what the stakes for the world are, and he makes the ultimate sacrifice. The Village of the Damned isn’t a happy film, but it’s definitely one that makes you think, and empathize the various characters. I rate it 4 stars and recommend it highly. Gordon Zellaby (George Sanders, The Picture of Dorian Gray). The middle-aged man whose has a son that he loves late in life – David. Anthea Zellaby (Barbara Shelley, Divorce American Style). Gordon’s wife, David’s mother. A loving wife and mother … who learns to fear her son. David Zellaby (Martin Stephens, The Witches). Gordon’s son. Or is he? Alan Bernard (Michael Gwynn, The Curse of Frankenstein). Gordon’s brother, a military man who leads the initial investigation … and becomes convinced of the children’s threat to the world. This moody little sci-fi classic has it all over the competition when it comes to possessed tykes with telekinetic powers. Midwich’s mysteriously hatched brood bores into the subconscious both with their eyes and with their creepy Hitler Youth-like presence. Based on John Wyndham’s 1957 novel The Midwich Cuckoos, and starring George Sanders as the most skeptical of the “miracle” parents, Village gets off to a rousing start when the isolated town of Midwich is cordoned off after some invisible knockout gas descends from above. A few weeks later, every female of childbearing age is pregnant. Much anger and consternation ensue, especially in those families for which the blessed event isn’t a blessing. Nine months later: a town full of blue-eyed, golden-haired cherubs with telekinetic and telepathic powers. The kids mature at an alarming rate and travel the streets in packs. Anyone who looks at them sideways meets with a violent accident. Barbara Shelley, Sanders’s wife, is scolded by her child; a motorist who is deemed a threat winds up driving into a wall. Doctor Willers: It’s not a matter of belief it’s a matter of fact! Alan Bernard: People, especially children, aren’t measured by their IQ. What’s important about them is whether they’re good or bad, and these children are bad. Originally begun in 1957 as an American picture to star Ronald Colman. MGM shelved the project because it was deemed potentially inflammatory and controversial, specifically due to its sinister depiction of virgin birth.